A tweaked version of the music game is providing a big boost in prosthetic research. Though Wiihabilitation continues to be popular among doctors seeking to help patients through physical therapy, researchers at John Hopkins University have cranked the volume on the concept to 11. 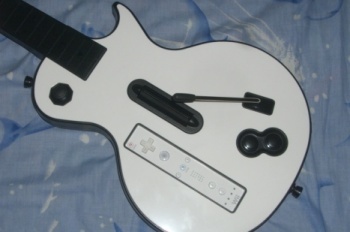 By modifying the controller for Guitar Hero III: Legends of Rock to interface with cutting edge prosthetic technology, they've made it possible for amputees to shred their way through the game with surprising accuracy. The research is part of a project being sponsored by the U.S. Defense Advanced Research Projects Agency, and the true goal is not to nail a high score in the music game. Rather, the aim is to eventually perfect an extremely realistic prosthetic limb that mimics a real arm - including finger movement. Several prototypes have already been developed thorough the project. Calibrating the mechanical limbs to correctly recognize and respond properly to electrical signals in an amputee's residual muscles is an exhausting and draining process. By using Guitar Hero, the researchers are able to speed up the tedious calibration process and make it more fun for volunteers. The highest recorded score among the experiment subjects was 70 percent; it's very impressive, considering the circumstances. This is an awesome idea, and a great example of how gaming can be used for good.